Performing Arts > Philosophy, aesthetics, relation to other arts, etc. Visuality in the Theatre proposes a new theoretical approach to the dynamics of looking engendered in the theatre. Visuality, this book argues, is not something we look at but something that we create by looking. Visuality is an embodied experience involving more than just the optical senses. The relationship between someone looking and something seen is fundamental to the experiences theatre and performance can evoke, while at the same time this relationship remains, to a large extent, invisible in the act of seeing. Bleeker offers a 'dissection of visuality', pointing to the close relationship between the mediations of the theatre and performance and apparatuses of vision (in both the dramatic theatre and its deconstruction on the contemporary stage). 'This new study by Dutch theatre and performance scholar Maaike Bleeker is an important work. 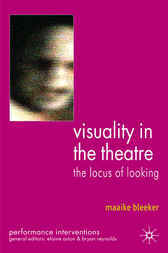 Its subject - visuality within theatre and performance studies – is new and in many respects Bleeker is quite literally defining a field. Her book provides critical and theoretical tools with which to analyse and better understand postdramatic theatre as part of today's visual culture.' - Professor Christopher Balme, Ludwig-Maximilians-Universitat Munich. MAAIKE BLEEKER is Professor of Theatre Studies at Utrecht University, Netherlands. She has previously lectured at the School for New Dance Development, the Piet Zwart postgraduate programme in Fine Arts and the Department of Theatre Studies at the University of Amsterdam. She also works as a dramaturg for various theatre directors, choreographers and visual artists.